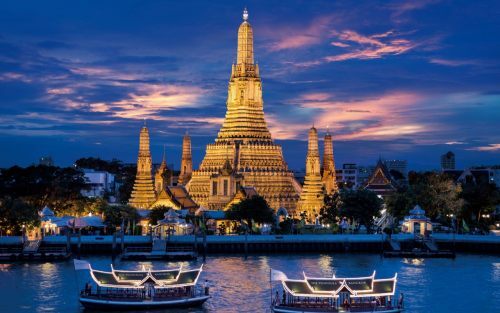 ANA (All Nippon Airways) has dropped the price of their flights from Saskatoon to Bangkok, Thailand down to $514 CAD roundtrip including taxes. ANA was ranked the #3 airline in the world last year. Many of the flights seem to have a 16 hour layover in Tokyo, Japan on the way there. 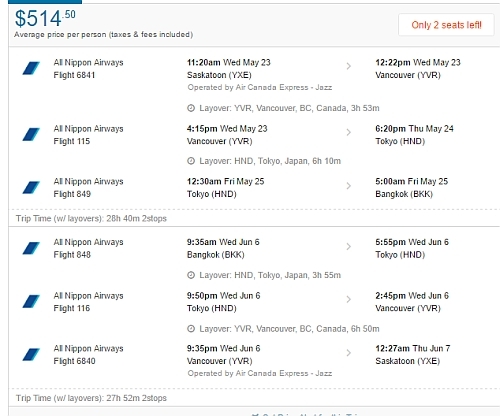 It's also possible to extend this layover in Japan to multiple days, for an extra $100. 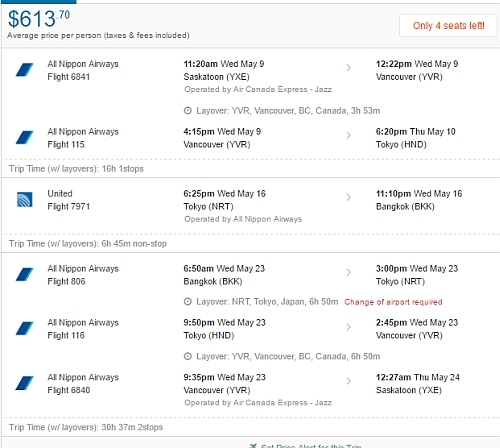 This is a new record for the cheapest flights from Saskatoon to Thailand. Obliterating the previous record that was set just a few months ago! Try searching for Monday, Tuesday, and Wednesday dates in one of the months listed above. NOTE: After your Flighthub search completes, click on 'Flexible Dates' to potentially see more dates. This option is not available on the mobile site. - Trips don't have to be 2 weeks, they can be longer or shorter. If you discover any dates that are operated by ANA both ways, please share them in the comments section below to help out your fellow travelers. ANA is a very good airline (ranked #3 in the world last year). - For dates, try using Wednesday to Wednesday dates for the first and third flights. - Play around with the middle date to give yourself more or less time in Japan vs Thailand. - Trips don't have to be 2 weeks, they can be longer. - Other days of the week may also work. I would focus on Monday, Tuesday, Wednesday, and Thursday dates. saskatoon, yxe, flight deals, asia, bangkok, thailand, bkk, southeast asia, united airlines, all nippon airways and ana. No Responses to "Saskatoon to Bangkok, Thailand - $514 CAD roundtrip including taxes | ANA flights (new record! ), add Japan for $99"